Publisher's blurb: "Dolls and Mirrors that haunt you, nightmares, folk tales of deathtraps that hunger for new prey and possessive panes of glass. 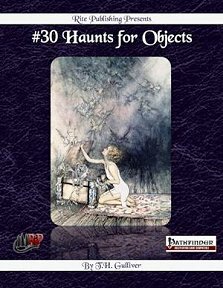 All of this you will find within the pages of #30 Haunts for Objects. "This product brings something to the game it has never had before, haunts that are no long trapped in one location. These haunts can be moved."